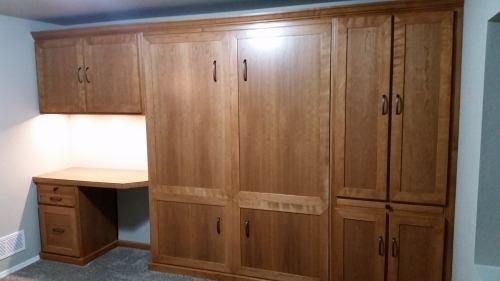 A Built In Cherry Wall Unit With Queen Bed, Side Cabinetry With Pull-Out Night Tray, Wall Mount Bookcase, A Desktop With Pedestal Bank Of Drawers. Remote Controlled LED Lighting Installed Under Wall Mount Cabinet For Desktop Illumination. Finished In Custom Wood Stain. Installed In Fountain, CO.